Painting friends is fraught with danger, perhaps the equivalent of the actors’ adage ‘never work with children or animals’. However, painting Nicky and Paul proved irresistible. I’ve known them a long time – Nicky’s a family counselor and Paul was in marketing and now writes. 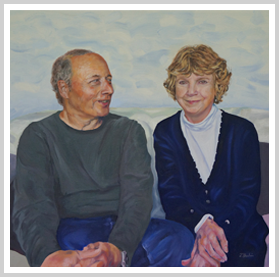 Relationships are fascinating and a painting of two people has a dynamic that a single portrait can’t match. Nicky and Paul have been together for 40 years and in the last five have been through the mill. Paul was diagnosed with ME, had a colonoscopy, followed by a perforated ulcer. He was wrongly diagnosed with terminal cancer, had radiotherapy and to cap it all had his health insurance payments cancelled. Enough health problems for more than one lifetime. But Paul’s found a way to cope, in many ways thrive.. but it’s so often the partner and carer who is forgotten in these situations – they too have it tough, but a different way. Nicky’s been brilliant, Paul’s rock. I’ve strived to communicate the powerful bond they have and the emotion behind their relationship.